I tore my ACL in a soccer game in September. A 50 50 tackle caused it ... I heard a crack and was in immediate agony on the floor. I thought my bone had snapped but looked at it to see no deformities at all. After about 10 minutes the pain suddenly went away and I managed to get up. I went off the pitch, jogged a bit, tried to plant my foot to turn and it cracked again and down I went in pain. That night my knee was very swollen and painful and I couldn’t hardly move it or weight bear. I got an MRI scan confirming I had a 'full thickness tear' to my ACL. I had a month off the gym as I regularly weight train. I couldn’t train my legs for a few months then in November began light weight training with them. This was possible as the ACL isn’t essential for closed chain exercises such as squats. My surgery was booked the following summer in June. Between November and June I began bodybuilding 5 days a week to get in the best shape I could be before the surgery. By April I was squatting quite heavy my best squat lift was 160kilo's. 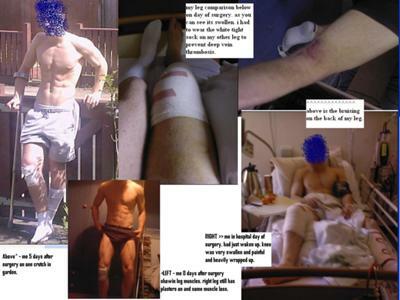 I wanted to develop the biggest strongest hamstrings possible as I was getting a hamstring tendon reconstruction. I take supplements such as glucosamine and chondroitin and found after a month or so of taking them my knee really improved. I also take flaxseed oil, L glutamine and calcium supplements. I had my surgery 8 days ago. The knee was very swollen when I woke up. The swelling seemed to go down rather quickly. The first week I tried to get as much movement as possible in the knee. Flexion to 90 degrees has been achieved and full extension almost. There is still slight swelling around the top of the kneecap next to the vastus lateralis muscle which hasn’t gone away. This seems to be restricting full extension. The bruising around my leg is unreal! All the back of my knee was purple and my whole calf was discolored and painful because of bruising as was my hamstring where the graft was harvested from. I was on two crutches for 3 days but read somewhere it was best to get weight bearing back as quickly as possible. I then used 1 crutch til day 5 and on day 6 found it comfortable to discontinue crutch use. I just have to be careful! I am on day 9 and waiting to see the surgeon in a couple of days. Haven’t yet seen a physio but I have read allsorts of rehab programs and am a student at university studying sports science and physiotherapy so I have some knowledge of it. Well this is all for now ... hope it goes well. I have included one or two pictures.